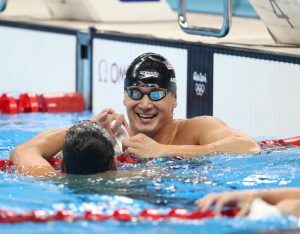 Bremerton’s Nathan Adrian was the fourth-fastest qualifier in the 50 freestyle Thursday at the Rio Olympics. Adrian finished second in his semifinal heat to defending gold medalist Florent Manaudou of France. Manaudou touched the wall in 21.32 and Adrian in 21.47. This is the first Olympic 50 free Adrian will swim as he didn’t qualify in the event in 2008 or 2012, when he was favored to do so. Joining him will be U.S. teammate, and former California teammate, Anthony Ervin who finished tied for first in the second semifinal with Ukraine’s Andrii Govorov in 21.46.